To drink or not to drink — that is the question surrounding Stuyvesant Town’s 5 Stuy Café, which recently reapplied for a wine and beer license. As Town & Village reported last month, the café filed an application but then swiftly withdrew it after management asked its operators for time to review the proposal. Since then, the café, with management’s blessing, has reapplied for a license to serve wine and beer and there will be a town hall on the subject for residents on Wednesday, April 3 at 6:30 p.m. at the Community Center, 449 East 14th Street. The application will also go before Community Board 6’s Business Affairs and Street Activities Committee (which has an advisory role) at a meeting on April 25. StuyTown Property Services announced the upcoming town hall in its weekly e-blast to tenants. A rep for CWCapital, who’d been scheduled to request a wine and beer license for Oval Café on Thursday, pulled that request on Tuesday. The license request for the Stuyvesant Town coffee joint had been scheduled to take place at a meeting of Community Board 6. However, by Tuesday afternoon, that application was scrapped due to a timing issue by that representative, Spencer Rothchild of Barrio Foods consulting firm, said Sandro Sherrod, the chair of CB6. Sherrod, who’s also a resident of Stuy Town, said he didn’t want to comment on the license request until he actually heard the proposal. And the request could be made again at another time. A spokesperson for CWCapital said the application was pulled pending consultation with community leaders. However, this was after the plan was blasted by John Marsh, president of the ST-PCV Tenants Association, and Council Member Dan Garodnick. Garodnick told Town & Village he’d made his feelings known to CWCapital expressing how “wholly inappropriate” he believes it is to have alcoholic drinks sold at the Oval. “To change (the café) to a place where people congregate for beers changes the entire establishment to something different and makes it less family friendly,” said Garodnick early on Tuesday. He added that he was annoyed about having to find out about the plan not from CW but from CB6. Still, he said he hoped management would rethink the plan. “They were responsive when we raised concerns about the Public Safety office and I hope they will consider this as well in the community’s interest,” he said. This was in reference to management’s agreeing to remove a driveway from in front of the new Public Safety office for the officers’ vehicles in response to residents’ complaints. Though he stressed he was speaking as an individual and not on behalf of the Tenants Association, Marsh also said he opposed a liquor license in a post on the TA’s Facebook page. Susan Steinberg, chair of the TA, added that even though the application has been pulled for the time being, tenants should still let CB6 know if they have something to say about it. Not everyone had been against the idea though. Still, she said she guessed there would be some controversy. Another resident, who’s lived in Stuy Town for four years, David Burstein, also said he didn’t think it would have been a problem. 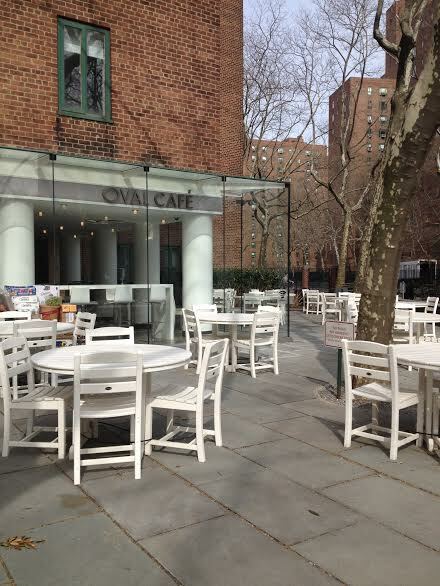 Since its opening in the summer of 2012, Oval Café has sold coffee, pastries and sandwiches and in the summer, offered a clear view of sunbathers on the lawn. Ironically, though there was never a liquor license previously at Oval Café or the amenity space that came before it, Oval Lounge, it was once the site of a bar-style brawl. It was there where brokers for then-owner Tishman Speyer got into a fight at a private party, with one getting bashed over the head with a beer bottle. This article was updated to include an additional comment from Council Member Garodnick, a comment from Susan Steinberg and information from Sandro Sherrod and CWCapital.